The following text was created for the Orlando Police Department Bulletin. This was an initiative by Officer Bill Edgar, a member of our officer advisory panel. If you would like to duplicate it for distribution in your department, please contact us and we will send you the text and illustrations. But don’t cyclists have to ride as far right as practicable? The lane pictured above is 13ft wide. Most of the lanes in Orlando are 10-12ft wide. Bicycle drivers are not required to keep right, and are encouraged, for their safety, to occupy enough lane that motorists recognize they must change lanes to pass. By riding this way, cyclists can avoid road hazards, operate more predictably, encourage overtaking motorists to pass safely and discourage common motorist mistakes that result in crashes. It is rare for a bicycle driver to cause a significant disruption in traffic flow. It’s important to recognize the many causes of delay and congestion on the road. Traffic lights cause tightly-packed platoons of cars. If a cyclist is unfortunate enough to be stopped near the front of the platoon at a red light, it may take a few seconds for traffic to shuffle around him after the light changes. Most likely, all of those cars will be stopping again at the next red light. Bicycles are as normal and necessary a part of the traffic mix as Lynx buses, school buses, garbage trucks, freight trains and traffic lights. Even I-4, which has none of those things, has long delays just from cars and trucks. This is an important safety issue! A significant contributor in crashes between cars and bikes is poor lane positioning by the cyclist. Riding too far right makes the cyclist hard to see and encourages motorists to squeeze past—dangerously close—in narrow lanes. In an effort to increase cycling safety and decrease crashes between bikes and cars, cycling educators are teaching cyclists to ride assertively on our roads. If you see a cyclist riding in the middle of the lane, it is likely that cyclist is educated about the law and how to ride safely. If a motorist complains about a cyclist riding assertively, take the opportunity to educate that motorist. Making our roads safer and more hospitable to bicycle drivers will make our community healthier and more livable. 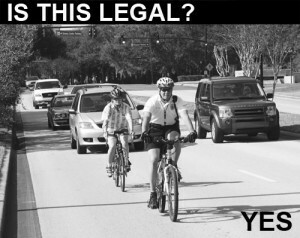 Bicycle drivers have the same rights and responsibilities as other drivers. Bicycle drivers must operate with the flow of traffic and obey traffic control devices. 316.2065 (5)(a)(3) applies to MOST roads in Orlando — A cyclist is entitled to the full lane when the lane is “substandard” (not wide enough to share). 316.151 (1)(b) gives a left-turning bicyclist the right to the full use of the lane from which the turn may legally be made (regardless of lane width). 316.183 Unlawful speed (5) only applies to MOTOR vehicles. 316.2065 (6) Two abreast only creates an unnecessary impediment if the lane is wide enough to share with a car when single file. If the lane is substandard, a single rider is entitled to the full lane so a second rider creates no additional impact. Cyclists are NOT required to ride in any place that would jeopardize their safety, this includes, but is not limited to, the door zone of parked cars, hazardous pavement, shoulders, safety zones, areas with poor sight-lines for crossing traffic, a part of the lane that would invite motorists to squeeze past them. Cyclists are NOT required to ride in empty parking spaces (a parking space is a traffic control device — a designated area for parked cars, NOT moving traffic). Geo and Officer Edgar: Thank you!! This is SO friggin’ excellent, THANK YOU, Officer Edgar and Keri! I’ll be forwarding this link around locally for sure! Officer Edgar is to be commended and congratulated for this bulletin. Thank you. Just because it is legal doesn’t make it safe. THANKS DRIVERS! Would it be possible to get a copy of this bulletin so I could distribute it to departments in my area. I live in Wisconsin, but the laws here are almost identical to the laws there and I’d love to have some documentation to show misinformed officers here. Yes! I’ve provided it to several folks from other states. If you email me at keribird_at_spamfence.net. I will send you files you can modify for page 1. Take a look at the text from page 2, if you send me corresponding statute numbers, I can modify the art on that second page for you. Regarding the 14 foot measurement; are there any statutes, regarding cyclists or motorists, that are determined and specifically defined by FDOT or any state agency guidelines? Has precedent been set that the legislation is specifically defining “sub standard width” as 14 feet? 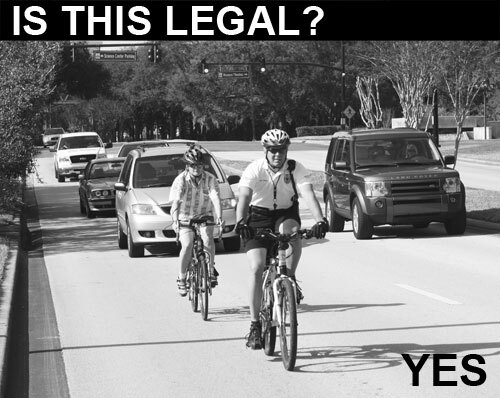 Do you beleive the spirit of the law was intended to allow cyclists the right to take the lane on virtually every road in Florida? Are you rendering legal advice? Note the reference made to “passenger cars”. Commercial vehicles inherently require additional lane width or must cross center line to safely pass a cyclist in a single lane. Thanks Rodney. My question was this: how is a FDOT recommendation legally binding to a statute? Precedent has been set, and not in your favor….following a guideline, with “recommendations” from FDOT, some of which are leass than the 14 feet you propose, does not define “sub-standard” in the courts interpretation of the statutes. You are providing an egregious disservice to cyclists if you continue with your flawed interpretation. There is nothing in the statute that points to FDOT recommendations, nor any other guideline you can produce. Statutes that specifically mention Transportation and the respective mandates placed upon Transportation pertaining to traffic control devices is not synonymous with the greenbooks recommendations and supposed definition of a sub standard lane. 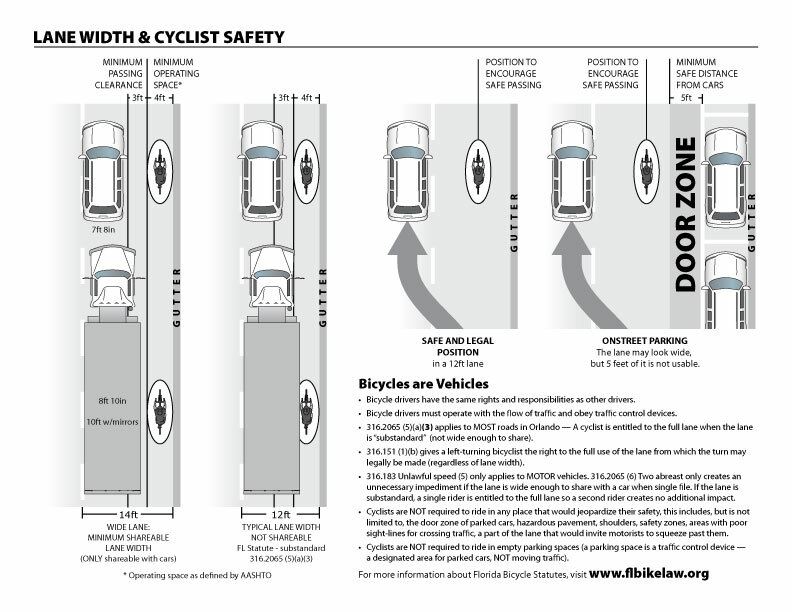 Just to show how ambiguous these bicycle laws are, it equally possible to argue that the meaning of the “minimum 3 foot pass clearance” ordinance, when read together with the literal language of the “ride to the right” ordinance exception for narrow lances, means that in those instances where it is not feasable for vehicles to pass bicycles with a 3-foot shy distance, it is the “as far as practable” language is disabled, not the “must ride to the right” provision and thus cyclists must ride as far to the right as absotely possible, even if it is not safe and practical, or alternately, must dismount and walk. I don’t suggest that this will be the outcome–it is certainly the case that supporting documents, legislative intent statements for the original bills, FDOT rules, policy and proceedures manuals and the like, will salvage the desired interpretation, but I suggest everyone (at least mentally) play the old planning school studio game; the class is divided into two teams. Team one draws up a zoning code. Team two designs the ugliest, nastiest, most awful development they can think of that still conforms to the code. Team one then modifies their code. Team two designs a still worse development. The lesson is that the more involved you get trying to fix things with words, the more unintended consequences you create, especially if there are readers of those words with very different values, goals and prejudices. It becomes quicksand. Thanks for the comments. We aren’t either. We don’t claim to know all the answers. We try to provide the information to bring attention to the lack of certainty in some of the statutes, and enable cyclists and others to make their own interpretations and decisions. We appreciate the views of everyone about the laws. My understanding is that to have the status of a state-wide “precedent”, there must be court decisions at a certain level and case law that is definitive. If you have access to the legal precedent to which you referred, please advise us. If any of our other attorney friends can enlighten us, we would appreciate that. The dismissed citations mentioned were recently reaffirmed in that jurisdiction. I would assume the legal department of a PD that publishes a legal bulletin is reviewing and approving such a document. We would hope to eventually reach the point where all decisions on these matters will be decided uniformly, and cyclists and law enforcement will be able to rely on consistent application of the statutes. That may require some updates to the present statutes, and may become part of FBA’s legislative agenda. Your input will be helpful. I know anything is possible, but is it conceivable that that interpretation would be realistically considered? The statute that requires the three feet places no obligation whatsoever on the cyclist. 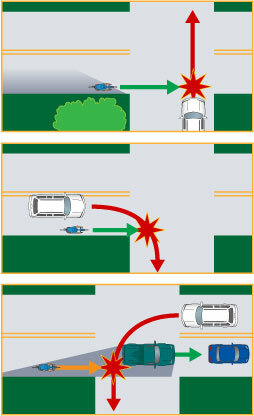 The position of the cyclist in the roadway is not a consideration. It discusses the responsibilities of the overtaking driver, wherever the cyclist might be. The burden is entirely on the overtaking driver. (1) ….. The driver of a vehicle overtaking a bicycle …. must pass the bicycle …. at a safe distance of not less than 3 feet between the vehicle and the bicycle ….. The eventuality you propose might require intentional exposure to an unsafe condition, which seems counter to all traffic law. Your supposition does seem to give support to the proposal of some to eliminate the “far right” provisions entirely. What is safe is virtually always legal. That is the basis of traffic law. 2 Pings/Trackbacks for "A Department Bulletin to Help Officers Understand Cyclist Safety and Lane Use"